From Linebaugh Ave go South on N Dale Mabry Hwy/580. Turn right/West on W Humphrey St, then right on Mullins. Follow Rd to Whispering Oaks subdivision on right. Turn left after you enter gate & follow until Dunnie. Take right at Dunnie. Hello, I’m interested in 4639 Dunnie Dr and would like to take a look around. 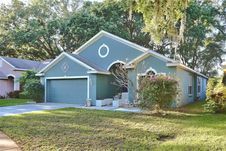 The details on 4639 Dunnie Dr: This house located in Egypt Lake - Leto, Egypt Lake-Leto, FL 33614 is currently for sale for $310,000. 4639 Dunnie Dr is a 2,023 square foot house with 4 beds and 2 baths that has been on Estately for 3 days. 4639 Dunnie Dr is in the Egypt Lake - Leto neighborhood of Egypt Lake-Leto and has a WalkScore® of 11, making it car-dependent. This house is in the attendance area of Crestwood Elementary School, Leto High School, and Pierce Middle School.